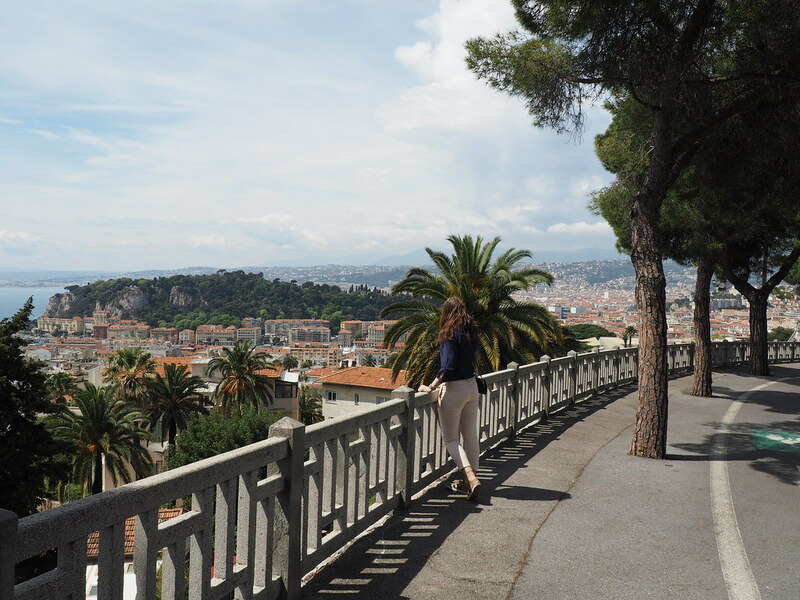 Visiting French Riviera was definitely one of the best experiences one could imagine. Even in 3 days in French Riviera, we managed to hire a car and do a road trip visiting Nice, Cannes, St. Tropez, Monaco and even St. Paul de Vence! This itinerary would work for you if you have 3 to 4 days in French Riviera (Cote D’Azur). Check the prices and availability of flights to Nice now! French Riviera in 3 days: is that enough? Well, at first, I was very sceptical about our upcoming trip to French Riviera, since I wasn’t convinced, that we could see enough in just 3 days in French Riviera because this place is marvellous and people are usually coming for at least 2 weeks (or the whole summer if they are lucky enough). But well, now I can say that I’m very satisfied with the trip and wouldn’t change pretty much anything in it. 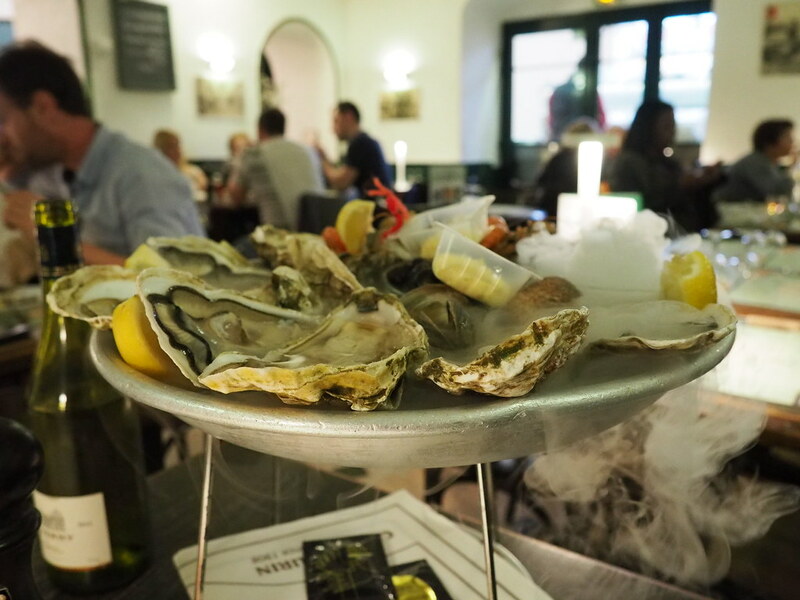 So French Riviera in 3 days was just enough for us and I would love to share with you our itinerary. Well, technically, we had 4 days in French Riviera, but if you count full days only, that would be 3 days. Where to stay during a road trip through French Riviera? Since our Cote D’Azur trip was relatively short, we decided to make Nice our base and spend all our nights there. If you’re looking for great affordable hotels in Nice, consider Hotel 66 Nice or NH Nice. If you have bigger budget, Boscolo Exedra Nice (Authograph Collection) or Hotel Negresco are both amazing options! I get asked a lot, which camera gear do we use. Long story short, I now use Sony A7 III with the Samyang 35 mm compact lens, Sony A6000 with the kit lens and iPhone 8 Plus. Once we arrived at the airport in Nice, we hired a car from Avis (hiring a car in Nice DEFINITELY needs another post, so check it out). Driving in Nice isn’t complicated as long as you have a phone with Google maps and 3G. We arrived at our lovely apartment (since we booked last moment, pretty much all the nice and affordable hotels were gone). As it was my birthday, went to the city centre to walk and wait for amazing dinner. However, if you have a bigger budget, I recommend you to stay in a hotel with parking included. I must admit, that at first, I was really disappointed by Nice. We went to Gare (Railway Station) in order to find the nearest money exchange office and this part of the city looked quite dirty. Moreover, it wasn’t possible to eat literally anywhere. It was around 4:40 pm and the service in the restaurants stopped. Tip: In case you want to eat around 4-6 pm, look for a restaurant in advance! Some spots in the city centre don’t stop their service, but most of the places do. Alternatively, you can eat fast food or sandwich (those places are always open). We took a tram to the city centre in order to walk around & try to find something to eat. Finding a place in the city centre was much easier, so we grabbed a piece of «french pizza» and continued walking. 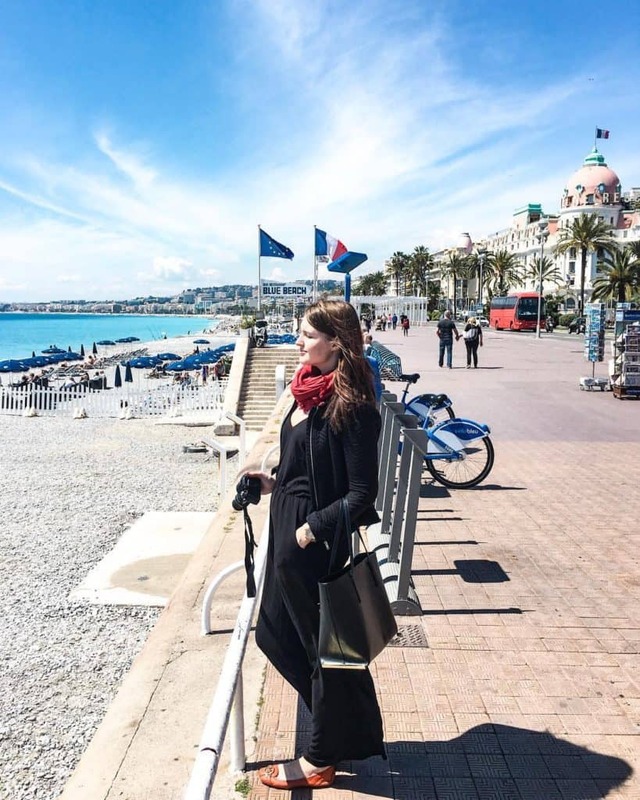 On the next day, we decided to discover Nice for a while: we went to the Promenade des Anglais and enjoyed the sunny weather while walking on the beach. Finding where to park near the beach wasn’t hard at all: there are plenty of underground parking lots and they even allow you to leave your car for free for 1 hour. Is Nice worth visiting? Yes, totally! The city is beautiful and the weather there is amazing, so it’s an amazing starting point of the 3-day itinerary around French Riviera. 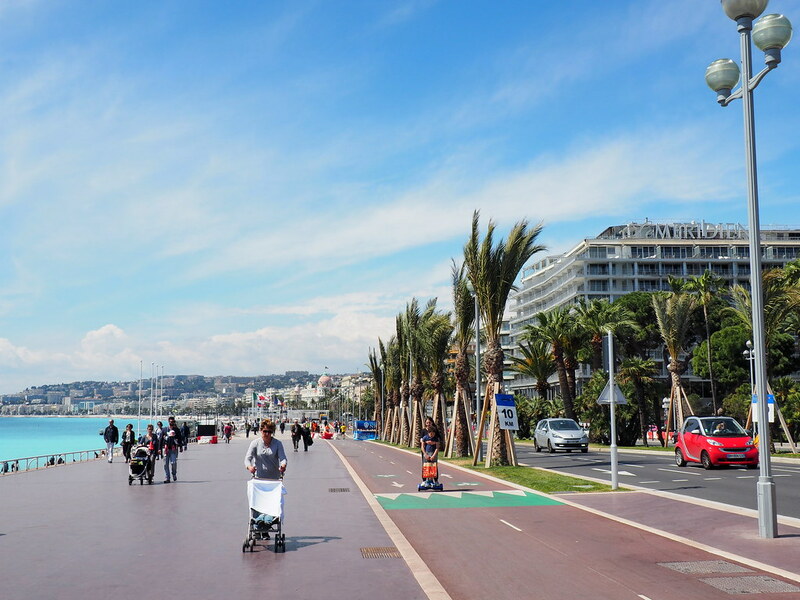 It’s very convenient to stay in Nice, if you’re planning to do a road trip around the French Riviera, because of the convenient location of Nice! The highway to St. Tropez has some pay tolls, so the total cost of going to St. Tropez from Nice is around 5.7 euros (maybe a bit more if you stay on the highway a bit longer). Because of some heavy traffic in different parts of the route, getting from Nice to St. Tropez took longer than expected: around 2 hours. But it was totally worth it. St. Tropez is a very cosy small Mediterranean town with plenty of seaside restaurants, expensive yachts in front of them and souvenir shops selling clothes white as pearl. Even though a lunch in St. Tropez is probably going to be quite expensive (around 60 euros for 2 people), you can always stay on a budget in Cote D’Azur (yes, that’s possible) by ordering a buckwheat crêpe, stopping by an ice-cream cafe or some cake shop. The most enjoyable activity in St. Tropez is walking around the town and enjoying it. Unfortunately, we haven’t been there in the evening to check out the nightlife, so I cannot tell you anything about famous posh lounges and bars in one of the most luxurious places in French Riviera. If you ask whether St. Tropez is worth visiting, I’d say YES right away. But if I had to choose between St. Tropez or Nice, I would probably choose to stay in Nice, as it’s closer to the airport and it’s definitely way easier to discover French Riviera in 3 days from Nice vs St. Tropez. Is St. Tropez expensive? Yes, it is. In order to have a nice lunch, you will probably need to spend at least 50-70 euros and that’s quite a lot. Hotels in St. Tropez are also quite expensive, so staying in St. Tropez during a road trip around the Cote D’Azur is probably not the best idea. 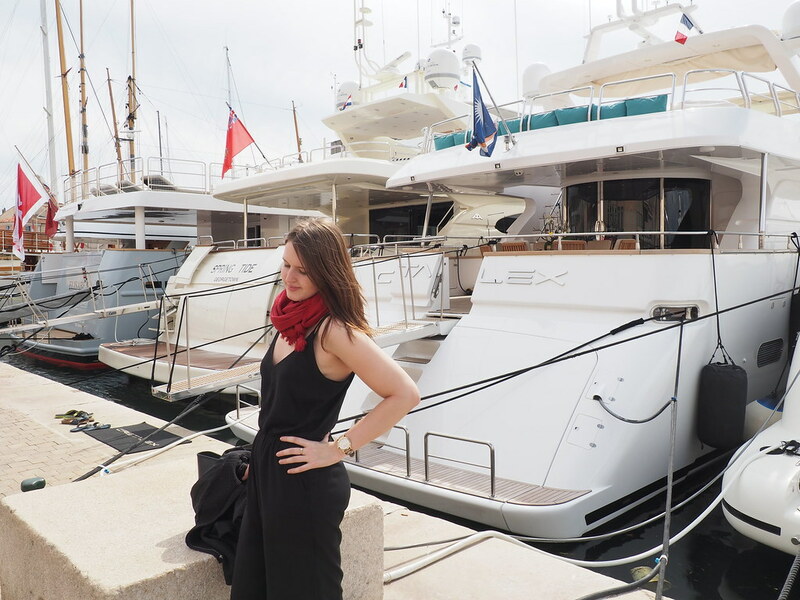 Just after visiting St. Tropez, we went to Cannes. 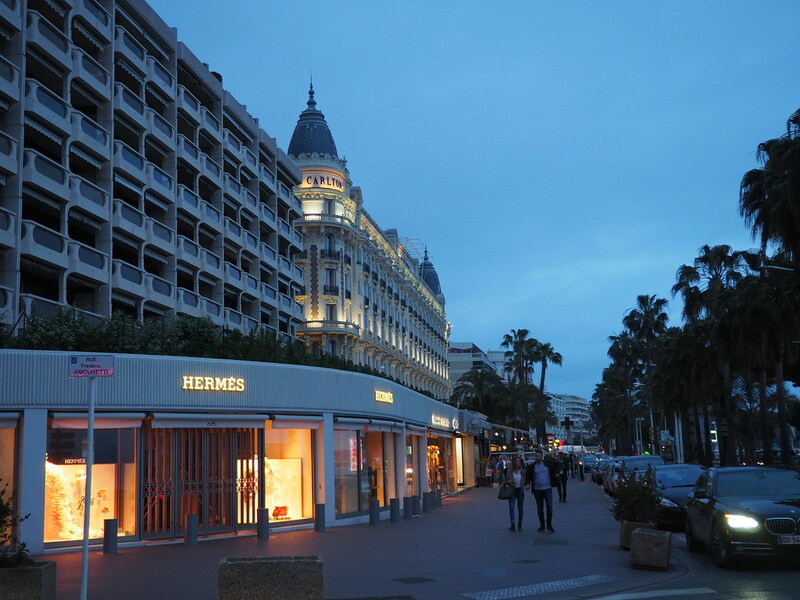 When we arrived at Cannes, it was already growing dark. The situation with the parking lots in Cannes is the same as in Nice: there are plenty of them just near the coast. So we left the car and went for the evening stroll along the promenade. 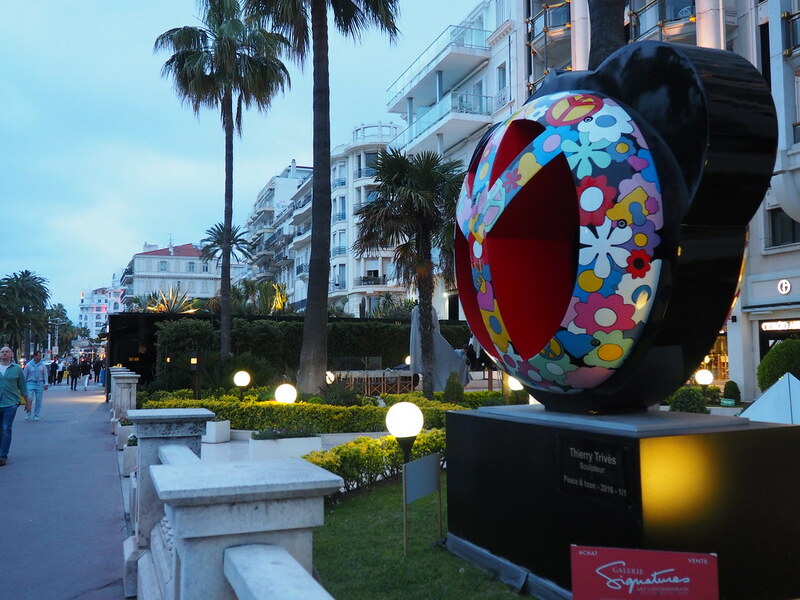 Cannes impressed me even more than Nice because the city is somehow …posher. That can be seen pretty much in everything: pretentious buildings on the seafront, fancy restaurant and rich guests (or maybe residents) of the city. When it was already very dark and started raining, we hid in one of the seafood restaurants, offering dinner menus for 25 euros per person. The dinner wasn’t bad, though incomparable with Cafe de Turin in Nice. I spotted an interesting thing in Cote D’Azur: people have the dinner a bit late! Most of the restaurants only open around 7-7:30 but start getting full only around 9 pm. At 11:00 pm, you still can find many restaurants serving food (unlike smaller cities in the UK, for example). Is Cannes worth visiting? Totally! 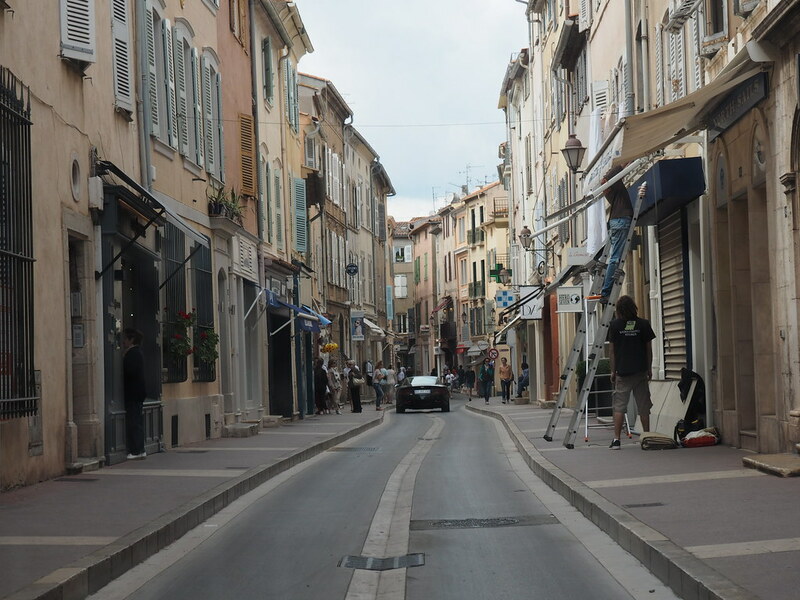 Make sure to add Cannes to your French Riviera road trip! 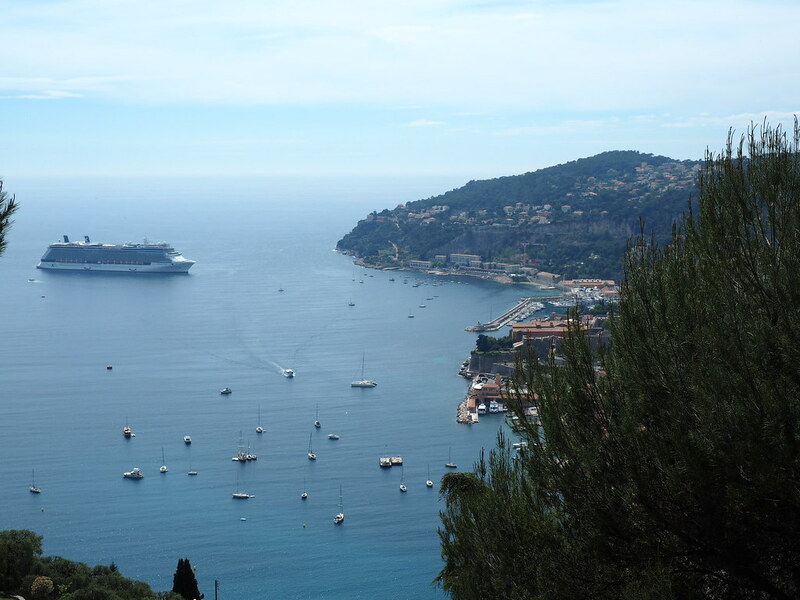 I wouldn’t take it out of our French Riviera itinerary. I loved the place and would like to return there for a couple of days in summer. On the next day in the morning we decided to go to Monaco and for that, we took the famous scenic route of the road trip around the French Riviera (not the A8 highway, even though it’s way faster) and couldn’t miss the opportunity to stop and take plenty pictures of Nice from the top of the hill. We passed Eze, a nice French village with a church on top of the hill and many religious shops and drove directly to Monaco, where we were looking for a parking for a while (trying to find the closest one to the city centre). We wanted to visit Eze, but when visiting French Riviera in 3 days, there’s no time to see everything. Since Monaco is full of underground tunnels, understanding where exactly the city centre was, was quite challenging. In the end, we just left the car at the only parking lot we could find (and it turned out to be quite centric – the exit of it led directly to the Japanese Garden with Koi fishes. 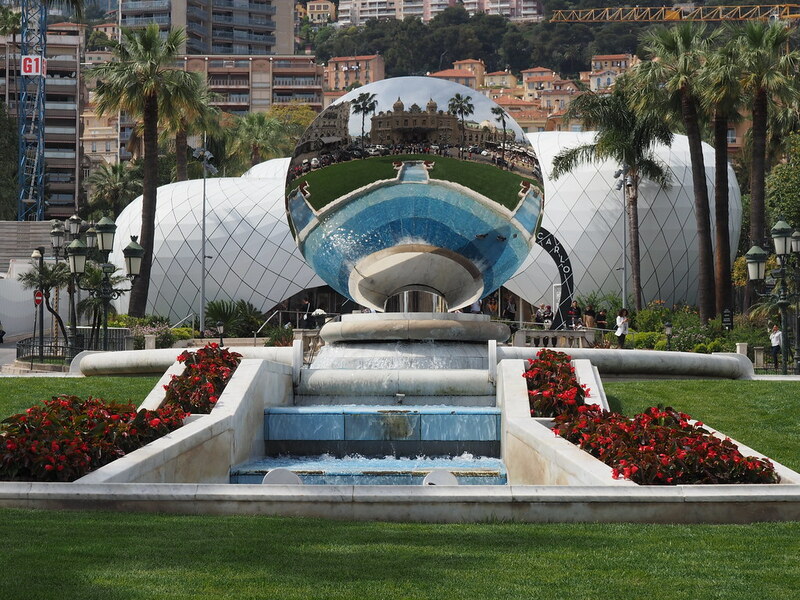 After discovering the Japanese Garden in Monaco, we went to the Casino in Monte Carlo. It is possible to get inside if you’re dressed properly but it’s strictly prohibited to take any photos. It is also possible to gamble if you want (also, if you follow the dress code). Just in front of the Casino Monte Carlo there is this famous Cafe de Paris (in case you want to dine, you get seated in the fancy part but if you only want to enjoy a coffee and a cake, you need to sit in a separate part of the cafe (where the waiters aren’t really friendly) and 99% of the seats were taken.And trying to squeeze in and try to wait inside the cafe intensively looking for people who are going to leave soon and rushing to take their table sounds more like McDonald’s and isn’t worth 9 euros for a coffee, so we decided not to go to the Cafe de Paris in Monte Carlo. 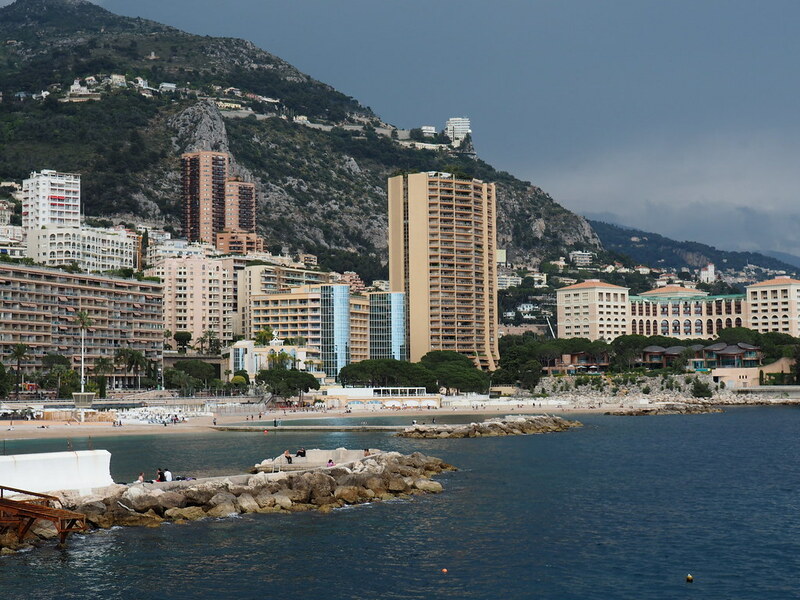 There is not much to do in Monaco besides fancy restaurants, bars, and nightclubs. There is a promenade leading to the beach (looks okay, nothing extraordinary). The whole Monaco looked like an ant hill to me: tiny homes, huge homes and literally no space left. There is not a single style of architecture, so all the houses look a bit differently, not mentioning some «skyscraper» style ugly hotels or offices. And all of them together don’t create a harmonic city panorama. I expected to see a unique posh polished town but Monaco isn’t like that: parking are creepy and ugly, many buildings aren’t renovated, there are construction works everywhere. When we left Monaco, it was already around 4 pm and our initial plan of going to Genova had to be replaced with some closer town in France. We’ve seen enough of coastal towns within the last two days, so we wanted something different for a change. So after a crazy town-search on Pepe’s iPhone, we found something worth visiting: Saint Paul de Vence. Honestly, I’ve never heard of this town before, but it looked absolutely charming in the photos and was only 40 minutes away from our tiny parking place on the way from Monaco to Nice. Is Monaco worth visiting? Well, to be completely honest with you, I wasn’t that impressed. In order to enjoy all what Monaco has to offer, you need to have A LOT of money, and that’s not a case for us at the moment. However, it was nice to finally see Monaco. If I had to choose between Cannes vs Nice vs Monaco, I would probably choose Cannes, but it’s my personal opinion. Getting from Nice to Monaco was super easy, so if you’re planning a French Riviera road trip, you can definitely include Monaco in your itinerary. In reality, Saint Paul de Vence really happened to be very charming, small and unique. We were really happy that we included it in our itinerary of French Riviera in 3 days. The most similar town to it which I could remember was Obidos in Portugal. But even if they share some similarities, they aren’t identical. We were a bit concerned that maybe everything will be closed already since we got there around 5:20 pm, but it seemed like the life in St Paul de Vence has only started. We were actually starving but all the restaurants were only (AGAIN!) opening at 7 pm. And moreover, they were fully booked. So finding a place to eat really was a challenge. Of course, there were fast food places serving sandwiches all day long but that wasn’t precisely something we wanted to eat in such a romantic town as Saint Paul de Vence. So we walked around, took many photos and finally found someplace with 1(!) free table a bit outside the city. 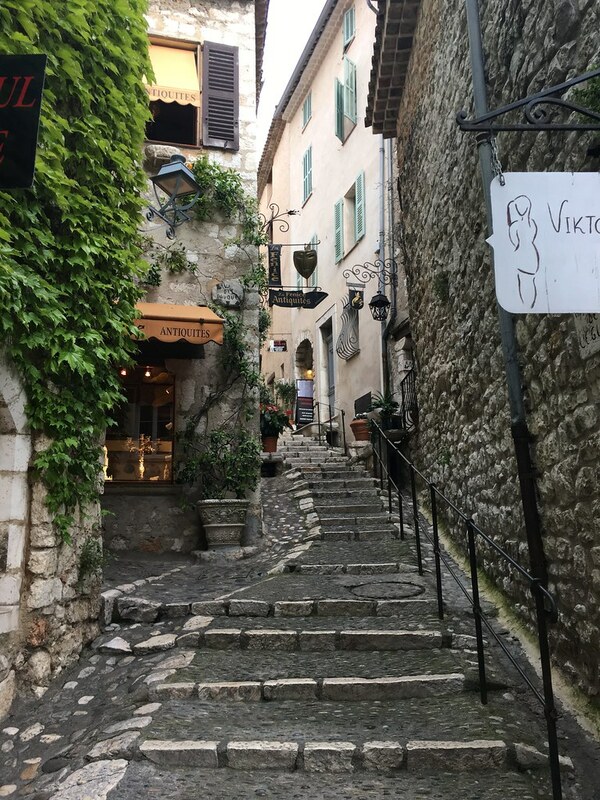 In case you’re planning to go to Saint Paul de Vence, better call beforehand and book a table otherwise you mind up being frustrated that there is no restaurant that could accommodate you. We left the town around 8:30 pm and got to Nice very fast, in less than 20 minutes. 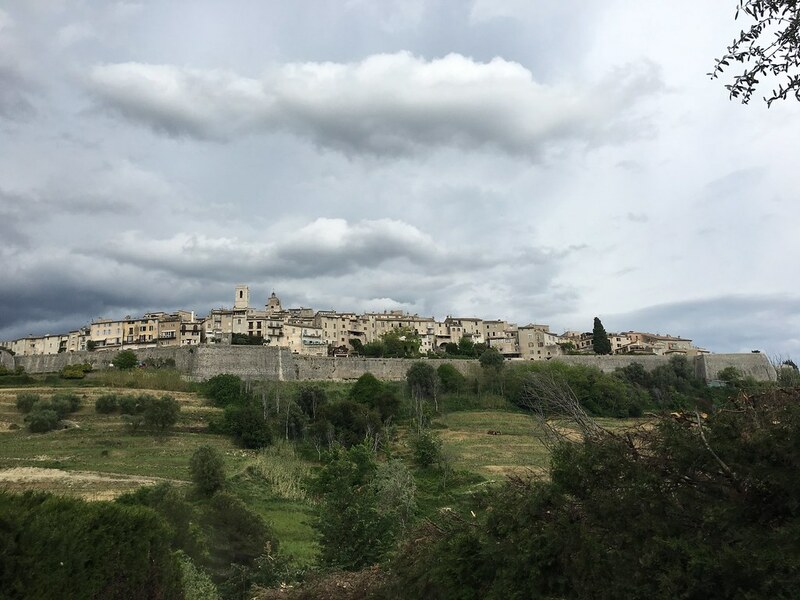 So getting from Nice to St. Paul de Vence is super easy and fast! But in Nice we encountered a new challenge: there was literally no place to park. Nothing. We drove around 50 streets near the flat where we lived and there was nothing! It was more frustrating than anything (I can’t imagine how people live in Nice if that’s the challenge they encounter EVERY day). Finally, we found a spot and parked our car, but just as we left the car, another car arrived and scratched ours while parking. Then there was a huge discussion in French with the car owner, who gave us his name and insurance and assured us that everything is gonna be alright but nonetheless, on the next day, Avis (the car rental service) blocked 800 euros on the account. However, they returned them later, when they cleared all the disputes with the person’s insurance company. What to do when you crash a rental car? Read it in this post. To summarise: 3 days in French Riviera in April were amazing. The weather in French Riviera was warm but still a bit unpredictable (it could be sunny but it could be also raining a lot, you never know). But anyway, it’s a wonderful place worth visiting. And when you’re already going to Nice, even if it’s just a few days, try to visit the towns nearby as they all are unique and not similar to one another. Discovering French Riviera in 3 days is also perfectly possible, so if you don’t have many vacation days, you can try to see French Riviera in 3 days just like we did. Well, it was actually 4 days, if you count the last day, but since my flight was early in the morning, I didn’t really count it and didn’t name this post “French Riviera itinerary for 4 days”. Please note that this page contains affiliate links, that means that we will receive a tiny commission at no cost to you if you decide to purchase something using these links.